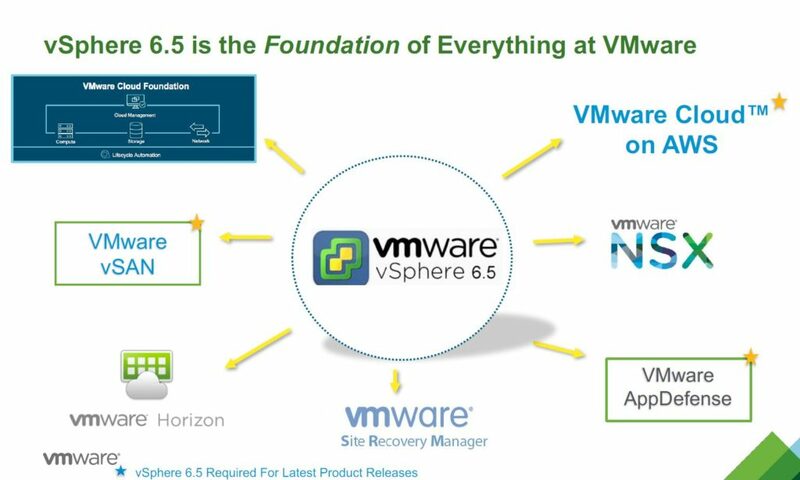 VMware vSphere continues to be the de facto corporate standard virtualization platform. The wide adoption of the platform means there are many thousands of vSphere clusters out in the wild which are likely running ESXi versions far past their prime. 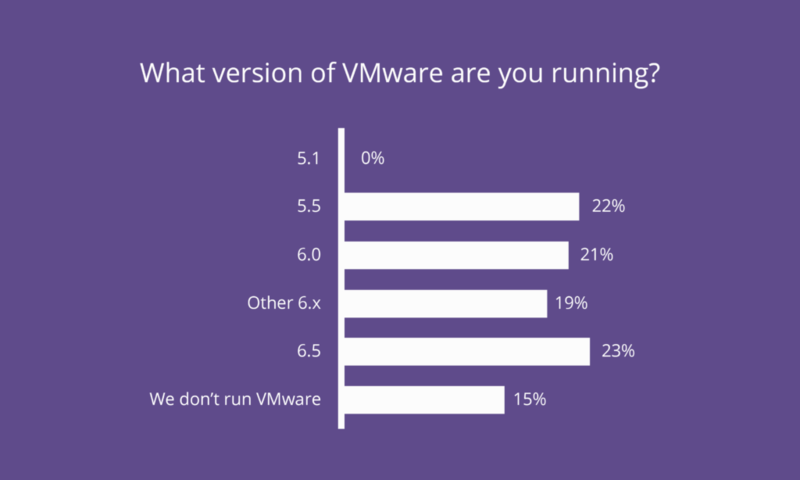 At the 2018 Dasher User Technology Forum, we asked the audience what version of VMware they are currently running and the following chart provided us with a bit of a surprise. The graph below represents over 125 participants. We were excited to see that the adoption of 6.5 is well underway, but it is certainly apparent to the 22% still on 5.5 that they should be planning now for running unsupported software or make plans to upgrade to 6.5 or at least 6.x. As we spring into summer, we fast approach a very important deadline: VMware has announced the general support for vSphere 5.5 will end on September 19th 2018. VMware is strongly recommending customers running vSphere 5.5 upgrade their environment to vSphere 6.5 as soon as possible. The latest revision of ESXi and vCenter come with a long list of feature additions and enhancements making the push to upgrade quite compelling. vSphere API explorer was introduced with VCSA 6.5. This tool allows administrators visibility into available APIs across a variety of VMware platforms including, but not limited to, vSphere, vRealize, vCloud Suite, VSAN and NSX. Virtual machine (VM) encryption was introduced at the hypervisor level in vSphere 6.5. Taking the encryption from the guest OS level to the hypervisor allows for VM encryption agnostic to guest OS or datastore type. vCenter is a KMIP client that is compatible with a variety of KMIP key manager services. This policy based VM encryption approach makes it simple to apply encryption to one or many VMs. vMotion encryption was also introduced in vSphere 6.5. This is a per VM setting and by default is set to “opportunistic” meaning it will use encryption if supported by both source and destination ESXi hosts. “Disabled”, “opportunistic”, and “required” are the three configuration options available when using encrypted vMotion. vMotion encryption encrypts the vMotion data being sent, and not the vMotion network itself. One time use key and nonce are generated by the vCenter server, no external key manager is required. Secure boot support for virtual machines as well as ESXi hosts was introduced in vSphere 6.5. UEFI firmware will validate the digital signature of an OS kernel during boot time. Secure boot in ESXi extends this feature to installed VIBs using the same digital certificate to verify integrity of each individual VIB referenced at boot time. EFI firmware is required when enabling secure boot for VMs, and can be enabled via checkbox within the settings of supported guest OS VMs. Logging enhancements have also been made to add value to log messaging. For example, events that triggered “reconfigured” event info messaging now include information on what has been reconfigured and the values pre/post the configuration change being made. The new VCSA 6.5 comes equipped with improved analytics giving administrators even more insight into the health of vCenter instances. In addition to CPU and memory metrics, statistics for network, database, disk usage, and overall system health is provided. Proactive HA has been introduced with vSphere 6.5. Proactive HA will work with hardware vendor provided plug-ins to determine if the health status of an ESXi host is degraded. When host degradation is reported, hosts are placed into Quarantine mode and VMs are migrated to healthier hosts in the cluster. Future migration efforts will avoid Quarantine hosts until health status is improved. VM Distribution can now be enabled via a checkbox. This will use a best effort strategy to evenly place VMs across hosts while respecting performance. Fault Tolerance improvements to reduce network latency between VMs and allow multiple port groups to participate FT logging. One of the most important enhancements to lifecycle management in 6.5 is the integration of Update Manager into the VCSA. Update Manager UI is now a part of the vSphere Web Client and is enabled by default on all new deployments of VCSA. External Windows based Update Manager instances can still be utilized, but only with Windows vCenter Server instance. The VCSA can’t utilize a Windows based Update Manager server. Storage is one of the most important aspects of virtual infrastructure. From traditional SAN to hyperconverged infrastructure, vSphere 6.5 offers storage enhancements for every datacenter. vSphere 6.5 brings with it a series of networking enhancements that increase flexibility/scalability and reduce management complexity. Most impactful of these features is the ability to define gateways on a per VMkernel basis. This will allow each VMkernel port to define its own gateway address, eliminating the need for creating static routes on behalf of VMkernel routing requirements. Network monitoring and analytics also received a boost with the inclusion of ERSPAN port support. This feature allows traffic from one or more source ports to be mirrored to a separate destination port for use with 3rd party packet analysis tools. There are a few things to note when planning your upgrade to vSphere 6.5. With the addition of the long awaited HTML 5 web GUI, comes the deprecation of the C# client we have all grown so accustomed to. VCSA has now surpassed and completely replaced the Windows vCenter server.